The provisional articles of union were agreed by commissioners representing Scotland and England during negotiations in London between April and July 1706. The majority of Scots were hostile to the proposals, while aspects of the initial agreement alienated powerful interest groups in Scottish society. The Kirk obtained a major concession in the form of separate legislation, An Act for securing the Protestant Religion and Presbyterian Church Government, which was designed to secure its status in Scotland after the union took affect. 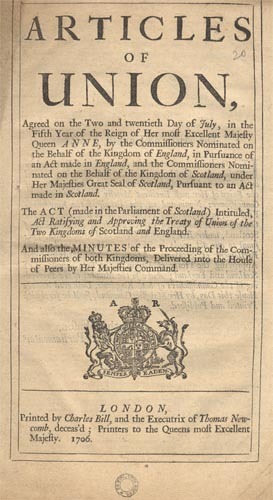 As the Edinburgh parliament debated the articles over the last three months of 1706, a number of other alterations were made to the original agreement, including a number of tax-breaks on important Scottish products like salt.